ChemLINE® polymer coatings protect aggressive industrial environments and transport equipment. Advanced Polymer Coatings is a world leader in developing specialty coatings for high performance applications, protecting against damage from corrosion and chemical attack, and providing safe storage and transport of chemicals whether on land or sea. The company is based in Avon, Ohio, USA, near the heart of the world's leading polymer research centers and testing facilities. For the industrial coatings industry, APC has formulated the ChemLINE® brand of coatings to provide unique high performance coatings that are 97% to 100% solids with extremely low VOCs. ChemLINE® is based on a cross-linked organic-inorganic polymer to attack problems and corrosive deficiencies of conventional protective coatings and linings such as vinylesters, epoxies, rubbers, phenolics, and stainless steel. The ChemLINE® coating system significantly improves anti-corrosion resistance and maintains product purity. Following application, ChemLINE® is heat cured, which results in a cross-linking of the polymers together into a tightly knit, extremely dense 3-dimensional molecular structure with up to 784 cross-links versus 4 for epoxy and vinylesters. And unlike other coatings, ChemLINE® cross-links through an ether (carbon-oxygen-carbon) linkage. This eliminates high concentrations of hydroxyl groups (found in epoxies) and precludes formation of ester groups (found in vinylesters) that are subject to hydrolysis and acid attack. The hard smooth surface of ChemLINE® resists 98% of all corrosive acids, alkalis, solvents, gasses and materials at various temperatures. It is highly effective against extreme corrosion and erosion, with a temperature resistance capability up to 500°F (260°C). ChemLINE® serves several functions; to protect the infrastructure of the equipment from leakage and corrosion, and when applicable, to protect the chemical and/other liquid contained inside to ensure product purity. ChemLINE® is recognized as a GRAS coating, suitable for direct food contact service. More than 5,000 chemical and physical tests have been performed to provide clear data of how ChemLINE® performs for specific chemical needs. In addition, extensive testing and years of field service in transport, and at storage and processing facilities have proven ChemLINE® superior to stainless steel, epoxy and vinylester coatings. A number of coatings comprise the ChemLINE® family: ChemLINE® 784/32, ChemLINE® 784/31, ChemLINE® 2400 Series, ChemLINE® TDC, ChemLINE® AS, ChemLINE® LE, and ChemLINE® Caulk, Putty, and Primer. Each coating and product offers distinct benefits based on user needs. Today, ChemLINE® serves a wide range of markets with a long history of success and have been proven under the most arduous operating conditions. In the Transport Sector for over-the-road, rail, and barge transportation, ChemLINE® offers the outstanding capability to transport aggressive chemicals, by withstanding chemical attack, and also resisting the abrasiveness of pellets and crystals when carrying this media. In Europe, for over-the-road, rail and product tanker (ISO tanks), APC works closely with Hüni GmbH + Co. KG, from Friedrichshafen, Germany. Hüni GmbH + Co. KG has more than 45 years of experience as a high performance coating applicator for corrosion protection and uses ChemLINE® to coat an array of tanks, containers, and apparatus for the chemical industry and all branches of the processing industry. This working relationship began in 2004 when Hüni GmbH + Co. KG was looking to complete its portfolio of high performance coatings with a product that could withstand a wide array of hazardous chemicals. ChemLINE® has been the ideal choice to fulfill this need. Successful ChemLINE® applications for Hüni GmbH + Co. KG have included IBC's, ISO tank containers, bulk chemical storage tanks, process reactors, and scrubber columns. In another transportation industry, a sister coating, MarineLine®, is dedicated exclusively to the Marine Transport Sector, and is now employed on hundreds of marine chemical and product tankers worldwide traveling the high seas. In the Chemical Processing Sector, ChemLINE® presents corrosion solutions for chemical processors to protect their valued assets. ChemLINE® coatings do not allow permeation through the lining, thus protecting equipment and structures by resisting the inherent corrosive nature of hazardous chemicals. In the Petroleum Production & Refining Sector, ChemLINE® coatings are specially formulated for use in a wide range of applications in and around the operating environment. 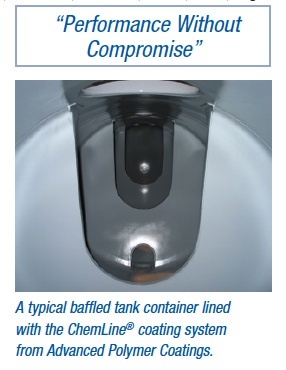 In the Tank Storage & Terminal Operation Sector, ChemLine coatings are considered an investment in the integrity and longevity of tanks against corrosion and chemical attack. 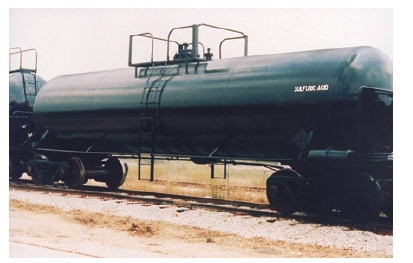 Because there are thousands of different acids, alkalis, solvents, and other liquids stored in tanks throughout the world, lining the insides of these tanks with the right coating system to prevent corrosion is paramount to ensuring a long service life for the tank and to protect the purity of the chemical inside. 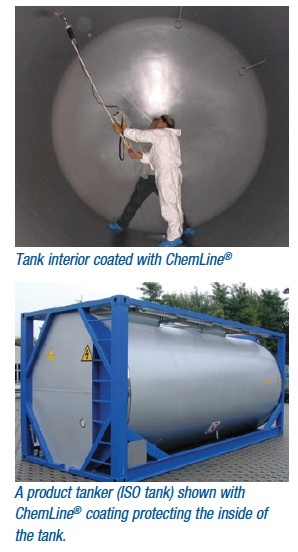 Other applications where ChemLINE® coatings have been effective include slurry tanks, pipes, scrubbers, FGD units, stacks, ducts, bag houses, tanks, trenches, pits, sumps, clarifiers, secondary containment areas, reactors, structural steel, hot steel structures and steam pipes, clean rooms, floors, rail cars and hopper cars. ChemLINE® caulk and putty kits are provided for covings, cracks, joints and the repair of coatings and pinhole damage as needed. In all ChemLINE® applications, surface preparation is vital. A successful coating application is based on the cleanliness quality of the surface. Abrasive type, size and geometry are all factors that influence cleanliness and the profile that will be achieved. Another important component for the ChemLINE® is to ensure proper application and heat curing, thus Advanced Polymer Coatings provides application and curing recommendations for all its ChemLINE® coatings and products. Every APC innovation is also backed by manufacturing expertise. APC has been granted a 3-year certification of the ISO 9001:2008 standard, by ABS Quality Evaluations, Inc. The ABS QE's ISO 9001 program provides a foundation to enable companies to improve their business economics. ISO certification is recognized throughout the world as a commitment to continuous improvement in all areas of our operations. Achieving ISO certification clearly illustrates APC's continuing high standards to produce quality products for our customers throughout the world. For more information contact Advanced Polymer Coatings.